Student loans come in many shapes and sizes. There are Stafford Loans, Perkins Loans, and a variety of private students loans available to students entering college. Choosing the best student loan heading into college is no easy task. After you graduate, your student loans may or may not fit your financial situation. Student loan refinancing is a new and potentially beneficial option for current student loan borrowers. 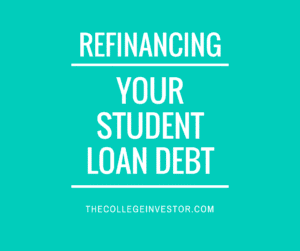 Refinancing student loans has been a popular topic over the last year because by refinancing and consolidating your student loans, you have the ability to customize your student loan repayment to your financial situation. Here are three important choices you should consider when refinancing student loans. If you have private student loans, you know that there are plenty of student loan lenders on the market. The same goes for student loan refinancing. Over the last two years, student loan refinance has become an attractive market for private lenders and investors. In 2011, Social Finance (aka SoFi) pioneered the student loan refinancing market. Since SoFi’s launch, an array of new lenders have entered the student loan refinancing space. Companies like CommonBond, LendKey, and U-fi have all entered the market and are looking for your refinance business. Comparing these lenders is a difficult task. Each lender offers a host of specific benefits and uses custom underwriting criteria. You may find yourself approved at one lender, and not another. Make sure to look at the benefits offered by each lender. As a result of all the recent competition in the industry, benefits have become a huge selling point. You should look for benefits that are important to you. For example, some lenders offer cosigner release. Others offer cash back rewards. And some lenders even offer programs to help you network and find jobs in your industry. One new company called LendEDU allows you compare all of the top student loan refinance lenders with one application. By starting your search at LendEDU, you can know that you are getting all the best rates and benefits with only one application. LendEDU works with lenders such as SoFi, U-fi, LendKey, CommonBond, DRB, iHelp, and others. Most student loan borrowers are given a 10 or 15 year term length to repay their student loans. When you originally take out a private or federal student loan you aren’t able to pick your term length. Most term lengths are generic and the same for every borrower. But by refinancing your student loans, you have the option to select a new term length for the repayment of your loan. Each student loan refinance lender has a unique set of term lengths available. In general, you will be able to pick from 5 year, 10 year, 15 year, 20 year, and 25 year term lengths for the repayment of your loan. Some student loan refinance lenders even offer 8 year and 12 year repayment terms. Each term length will have a different rate and monthly payment. As a rule of thumb, the shorter the term length, the lower the rate and the higher the monthly payment. The opposite is true for longer term lengths. If you select a 25 year term length, you will have a lower monthly payment but a higher interest rate. You will also pay more interest over the course of your loan. That being said, if you choose a longer term length, you still have the ability to pay off your student loan quickly. Virtually all student loan refinance lenders charge no pre-payment fees. LendEDU wrote a helpful guide which highlights all of the lender term lengths and interest rate options. All of the top student loan refinance lenders are reviewed and rated for easy comparisons. Some borrowers are looking to pay off their student loans as quick as possible. Others are looking to live more comfortably by spreading out the repayment. Either way, make sure that you pick the best term length for your financial situation and goals. If you have federal student loans you have a fixed interest rate. If you have private student loans you may have a variable or fixed interest rate. Fixed interest rates do not change over the course of the loan. In contrast, variable interest rates will change over the life of the loan. Variable rates will move up and down with market interest rates. Most lenders base their variable rates off the one or three month LIBOR. If interest rates go higher, your variable rate will go higher too. If interest rates go down, your variable interest rate will also go down. Today, interest rates are extremely low and those borrowers with variable rates are benefiting. By refinancing your student loans you will have the ability to select a new interest rate type. Most student loan refinance lenders offer variable and fixed options. Some even offer hybrid rate options. Meaning, the rate will be a mix of variable and fixed rates. If you are looking to lock into low rates, and are planning for a longer repayment, a fixed rate could be a great option. Fixed interest rates guarantee a constant monthly payment and may help you sleep a little better at night. If you are looking to repay your loans quickly, a variable rate might be a better choice. Variable rates tend to start about 1.5% to 2% lower than fixed rates. You can choose your rate and term length after you’ve been approved for the loan. So don’t worry about getting stuck with a particular option early in the process. Student loan refinancing can be a great option for creditworthy borrowers. Not everyone will be qualified, but if you do qualify make sure to consider all the different benefits and options available. In order to qualify, you will likely need to have good credit, gross income over $50,000, and a debt-to-income ratio below 40%.